During the course of Hank Schueler’s 13 month battle with leukemia, members of the Chicago Fire Department, along with many other friends and neighbors in the community played an important role in supporting the Schueler family, forging a permanent bond with them that has survived Hank’s untimely death. To help raise public awareness and money for the pediatric cancer research targeted by the 41 & 9 Foundation, Ignite suggested a bike ride around Lake Michigan to raise funds. So in 2010, Chicago Firefighters with Ignite the Spirit road their bicycles 941 miles around Lake Michigan, raising $50,000 in the Bike to Fight Campaign to support the research efforts funded by the Foundation. 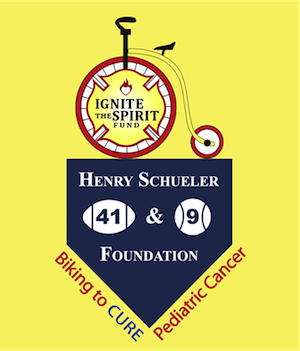 In 2011 Ignite the Spirit the Henry Schueler 41 & 9 Foundation once again partnered, this time riding their bikes from Chicago to Indianapolis to St. Louis, MO raising over $25,000 each for the 41 & 9 Foundation and the Ignite the Spirit Fund. In 2012, 10 riders from Ignite and the 41 & 9 Foundation rode their bikes from Redondo Beach, CA to Myrtle Beach, SC in the C2C Campaign to support pediatric cancer research at St. Jude’s Children’s Hospital through the work of the Henry Schueler 41 & 9 Foundation and to fund a 6 year academic scholarship program award in honor of Rich Pinskey, awarded to a CFD family who has battled cancer. In 2014 the Foundation and Ignite the Spirit will once again hit the road, this time from one historic baseball shrine to another. In honoring Hank’s love of baseball, we will depart from Wrigley Field on May 26 and travel over 1000 miles in 12 days before finishing our ride in Boston at Fenway Park. The goal of the Wrigley to Fenway Ride is to raise $100,000 for the two Foundations. Please consider supporting the 41 & 9/IGNITE team by contributing your time or your treasures to this inspiring bike ride. Any contribution is welcome. Checks can be written to the Henry Schueler Foundation and/or Ignite the Spirit and can be designated to a specific rider’s efforts. Ignite the Spirit’s support is vital to the ongoing research efforts being conducted on behalf of the Henry Schueler 41 & 9 Foundation at St. Jude’s Children’s Research Hospital and around the world. Wrigley to Fenway Ride for A Cure! We hope you will consider supporting the Ignite and 41 & 9 team by riding with us from Chicago to New Buffalo, MI and raising $500 for the Wrigley to Fenway bike ride. 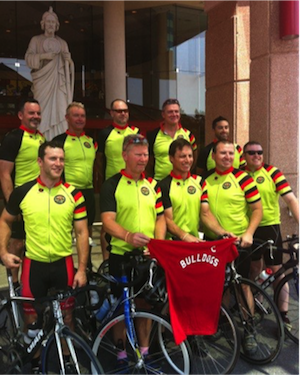 This 80 mile ride will leave from CFD Engine 78 on Waveland Ave next to Wrigley Field on Monday, May 26 at 8:30 am. There will be fully staffed rest stops and meals and drinks provided, along with dinner and drinks in New Buffalo and transportation for riders and bikes back to Chicago Monday night. Contributions can be made to the Henry Schueler Foundation and/or Ignite the Spirit. Contributions can also be made via PayPal at www.HenrySchueler.org or www.IgnitetheSpirit.org. We are also looking for a corporate sponsor(s) to assist us with our effort. If any of you know of a potential sponsor who might be interested in supporting our effort please email mschueler@sdc-atty.com or richpinskey@aol.com. Please join our team as we work toward a cure for Hypodploid Acute Lymphoblastic Leukemia and the secondary infections such as Zygomycosis which took Hank’s life. Your support is vital to the ongoing research efforts being conducted on behalf of the Henry Schueler 41 & 9 Foundation at St. Jude’s Children’s Research Hospital and around the world. Be a Hero and Join Our Team!